Without a doubt it was one of the most beautiful nights I’ve ever had! 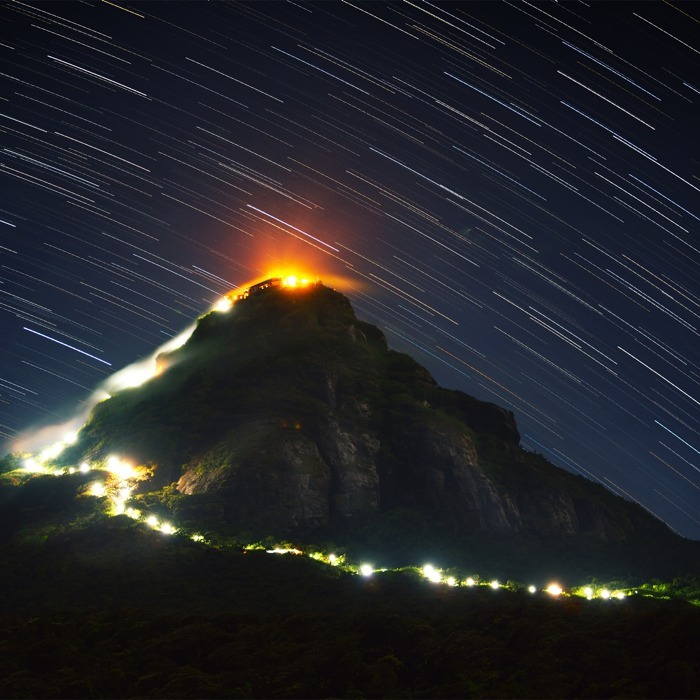 Adam’s Peak (2243 m), or Sri Pada, is definitely one of the top places to visit in Sri Lanka. It is an isolated peak standing tall in the country’s forested Central Highlands. If you haven’t chosen dates yet for your holidays in Sri Lanka and plan to do this scenic hiking, then consider that the best time to visit Adam’s Peak is from December to May, though April is a busy period when lots of pilgrims make the trip. There is a fantastic rocky indentation on the peak’s summit that is shaped like a large human foot – a unique feature which gives Adam’s Peak special significance in several religious. This curious foot shape was considered by early Christians to be the footprint of Adam, a belief which was inherited by Moslems when they ruled the island. Similarly, Hindus said the the indentation was the footprint of Siva. Buddhists considered it the footprint of the Buddha, and have now enclosed it in a shrine inhabited by monks. With all this religious respect, it’s not surprising that this mountain has been visited by thousands of pilgrims each week for over 2,000 years! Joining their ranks, you can climb 3,306 steps to the summit from the town of Dalhouse, and enjoy refreshments and other goods sold by vendors along the trail. The trail from the southeast has no steps, but it too has trail vendors, and both trails have streetlights all the way to the top for those seeking the thrill of a night hike in comfortable temperatures. To start your climbing adventure, you need to get to the Dalhouse village, which is about 3 hours driving from Hatton town and the same train station. The road winds through a hilly area, so the drive might be a bit hard for you if you have problems with motion sickness. Be prepared and have some pills or gummies in advance. In the Dalhouse village you’ll find lots of available accommodations, all more or less of the same quality and price. Unless you plan on spending a few days there, you’ will likely only need one night to do the summit. It’s best to start hiking in the middle of the night, around 2 am. The reason why I recommend starting so early is that as the stairs in the upper part get very narrow, it becomes very crowded. As a result, people move very slowly and there’s a risk that you won’t make it to the top of the peak before sunrise. And be sure not to forget mosquito repellent… sometimes traveling is hard work! After first hour and a half you’ll definitely start feeling tired as you walk up the stairs. Equip your daypack with a big bottle of water and some snacks to stay hydrated and satiated. It also might be quite chilly on the way up, so it’s best to have a fleece jacket (women, men) on top of your t-shirt, and a beanie wouldn’t hurt either. And don’t forget a rain poncho and a head lamp. By around 5 am you will reach the peak. Out of respect, you should be barefoot. However, since the floor is made of stone, it will get cold if you want to stay there till sunrise. I would recommend taking off your light hiking boots (men, women), putting them in your backpack and just wearing a thick pair of trekking socks (men, women). Try to find a prime spot to view the sunrise and just wait for this beautiful moment. After you fully enjoy the sunrise and take hundreds of pictures with your wide angle camera, tripod, phone and selfie stick, more hard work will be awaiting you! You’ll need to walk back down the stairs, which is not as easy as it seems after sleepless and exhausting night. On the way down you’ll find some locals selling hot sweet black tea and some snacks so you don’t feel so feeble and tired. The landscape will be amazing, with lots of green hills and lakes in the shadows of fog! And the sun, of course, will be lighting up all around you. It becomes hot very fast, so don’t forget to use sunblock for face and body as well as sunglasses. If you don’t get caught up in the chain of local vendors on the way down the mountain, then you’ll reach the village by around 10 am. This will leave you exactly enough time to take a shower and pack your bags before checking out. Then, enjoy some fresh breakfast and continue exploring Sri Lanka! Photos by Anna Nazarova and Shutterstock.